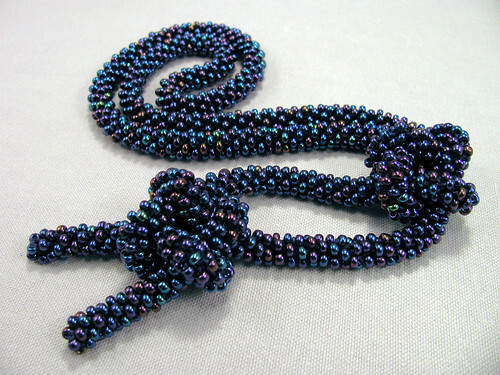 The bead crochet lariat necklace I made out of size 6/0 E beads and 2 strands of size 8 perle cotton is done. It was a really quick easy project. I love the weight. I tied 2 friendship knots in the ends, so it is a nice length. At girl scout camp each group had to wear a different color lariat. The older girls tied theirs in friendship knots, but wouldn’t teach us how to do it. They finally relented after almost constant pestering. I still like to tie these knots and remember carefree days, or at least days when tying a friendship knot in a lariat made one feel grown up. This entry was posted on Thursday, December 11th, 2008 at 3:00 am and is filed under Crochet. Tagged: Beading, Crochet, Thread. You can feed this entry. You can leave a response, or trackback from your own site.